These surface lesions may arise from any of the mesenchymal elements present along the bone surface or from the pluripotent cells found within the periosteum. However, in most cases, it is impossible to determine whether the tumor arose from within the periosteum or from other juxtacortical connective tissues, with secondary involvement of the periosteum. However, Chen et al,  while investigating the presence of insulinlike growth factor 2 (IGF2) and mRNA-binding protein 3 (IMP3) in conventional intramedullary, parosteal, and periosteal osteosarcoma, found that the first demonstrated primarily cytoplasmic staining, whereas the second and third demonstrated nuclear staining. The authors stated that these different expressions might reflect different roles for IGF2 and IMP3 in tumor angiogenesis, with those tumors expressing more cytoplasmic staining, demonstrating greater microvessel density. Radiographically, periosteal chondromas demonstrate variable mineralization within the lesion. A shell of new bone formation from the overlying periosteum may also be present (see the first image below). The underlying bone cortex usually is scalloped (saucerization) with various degrees of sclerosis. Cortical sclerosis is well marginated but may demonstrate a buttressing effect at the edges of the lesion. Lateral radiograph of a distal femoral periosteal chondroma; slight mineralization is present within the lesion, with periosteal new bone formation noted at the periphery. On magnetic resonance imaging (MRI), the lesion is best seen on T2-weighted images as a well-defined lobular mass (see the first image below). 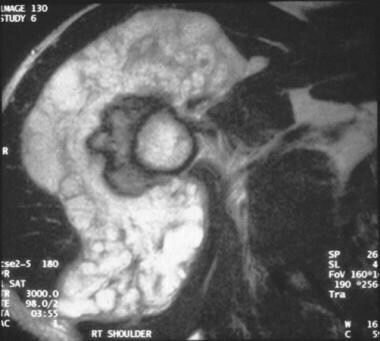 No evidence of tumor extension into the adjacent medullary canal is present (see the second image below). T2-weighted sagittal MRI of a distal femoral periosteal chondroma (same lesion as in the image above). The lobular nature of the lesion is evident, as well as the lack of invasion into the medullary canal. Axial MRI of a periosteal chondroma demonstrating cortical buttressing at the periphery of the lesion, as well as scalloping of the underlying cortex. These lesions tend to be smaller and better marginated than periosteal chondrosarcoma lesions. They may also appear similar to osteochondromas; however, periosteal chondromas do not demonstrate the medullary continuity on plain films and MRIs that is seen with osteochondromas. Histologically, these tumors are composed of lobules of mature hyaline cartilage, without evidence of permeation into the adjacent bone or soft tissue. Typically, a fibrous capsule overlies the tumor. Areas of the tumor may be hypercellular,  typically more cellular than the intramedullary (central) counterpart. Nuclear atypia, binucleation, and pleomorphism also may be noted. Occasional foci of necrosis and myxoid degeneration are present. However, this feature is not as prominent as it is in malignant lesions. Periosteal chondrosarcoma can be difficult to differentiate from periosteal chondroma. Patients with the former lesions tend to be older, with an average age of 35 years. Further, periosteal chondrosarcomas tend to be larger (see the image below) and demonstrate invasion into the underlying cortex. However, cortical scalloping and buttressing still may be seen radiographically. Anteroposterior radiograph of a periosteal chondrosarcoma. Dense mineralization is noted at the base of the lesion. Less well-defined mineralization is noted in the adjacent soft tissues. The lesion is larger than periosteal chondroma lesions. On MRI, they are seen as multilobulated lesions, confined to the juxtacortical area, with high signal intensity on T2-weighted images (see the image below). Typically, no medullary involvement is present. Axial T2-weighted MRI of a periosteal chondrosarcoma demonstrating the lobular nature of the tumor. Erosion into the underlying cortex is present, but the medullary canal remains uninvolved. Any bone seen within the lesion represents osseous metaplasia or enchondral ossification rather than direct production of bone by the tumor. If the tumor were directly producing bone, the diagnosis would be peripheral chondroblastic or periosteal tumor or osteosarcoma (see Surface Osteosarcoma). Parosteal osteosarcoma is the most common of the three subclassifications,  representing 65% of juxtacortical osteosarcomas,  3-6% of all osteosarcomas, and 2% of primary osseous neoplasms. These lesions are almost exclusively seen around the knee, typically along the posterior surface of the distal femur. Lesions occasionally may be seen at the proximal humerus. Radiographically, parosteal osteosarcoma appears as a radiodense mass on the surface of the bone. It usually is broad-based and may encircle the bone. Periosteal reaction, seen frequently in conventional intramedullary osteosarcoma, is not seen in the parosteal variant. If this is noted, it may represent a conventional osteosarcoma with extraosseous extension. Areas of lucency on plain films suggest the possibility of dedifferentiation, or more aggressive areas, in a portion of the tumor. MRI should be performed as part of the initial workup; it can identify the soft-tissue and, possibly, the intramedullary extent of the tumor. Intramedullary extent appears to have no correlation to outcome, as long as negative surgical margins are obtained. Jelinek et al demonstrated that the intramedullary extent usually is composed of low-grade tumor. Sheth et al found no statistically significant difference in the presence of intramedullary involvement of classic or dedifferentiated parosteal osteosarcoma,  though the correlation between the presence of intramedullary involvement and dedifferentiation has not been clearly delineated. MRI aids in preoperative planning to ensure adequate margins. Microscopically, the tumor is composed of a low-grade spindle cell neoplasm with minimal cytologic atypia. Bone formation occurs within this fibrous stroma. Areas of higher-grade spindle-cell sarcoma with decreased mineralization may be seen, frequently corresponding to radiolucencies on preoperative radiographs. 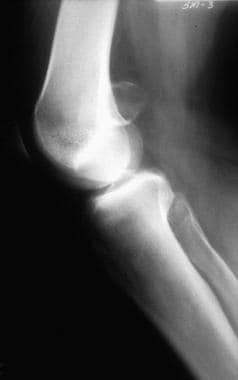 These lesions may also contain cartilage, increasing the difficulty in some cases in differentiating them from osteochondromas. Typical low-grade parosteal osteosarcoma does not express the higher MIB-1 indices or multiple chromosomal aberrations typically seen with higher-grade lesions. To help distinguish low-grade, including parosteal, osteosarcoma from radiographically similar benign lesions, Yoshida et al  used immunohistochemistry to assess for the protein products of the oncogenes murine double-minute type 2 (MDM2) and cyclin-dependent kinase 4 (CDK4). They found that 57% of the tumors in their series were positive for MDM2 and 100% for CKD4, whereas only one in 40 benign lesions were positive for either, resulting in 100% sensitivity and 97.5% specificity for the presence of a low grade osteosarcoma. Dujardin et al,  in a similar study, found no immunopositivity among benign lesions or high-grade osteosarcomas and consistent positivity among low-grade osteosarcoma, including parosteal osteosarcoma. In addition, this group found amplification of MDM2 and CDK4 genes among low-grade osteosarcomas, whereas no amplification was noted among benign or high-grade lesions. The possibility of higher-grade areas within dedifferentiated parosteal osteosarcoma lesions emphasizes the need for adequate sampling of the tumor at biopsy. This constitutes the dedifferentiated variant of parosteal osteosarcoma. By virtue of its low-grade nature, as seen histologically, parosteal osteosarcoma has the best prognosis of any of the variants of surface osteosarcoma, with survival rates of 80% at 20 years postoperatively in the Memorial-Sloan-Kettering series  and 90% at 5 years postoperatively in the Mayo Clinic series  using surgery alone. Okada et al found a statistically significant increase in local recurrence following intralesional or marginal resection versus wide resection (41% vs 0% at 5 years postoperatively). Song et al,  in a review of patients referred after intralesional resections of parosteal osteosarcomas, noted a 45% local recurrence rate after repeat resection; the recurrence rate was lower, however, if patients underwent repeat resection prior to the development of gross recurrence. However, wide margins may be difficult to achieve for distal femur lesions due to the proximity of the tumor to the popliteal vessels. Okada et al found that of those parosteal osteosarcomas evaluated with cross-sectional imaging, the neurovascular bundle was invaded in 22% of cases and displaced in 62% of cases. However, this does not necessarily preclude wide resection and limb salvage. Okada et al found a rate of metastasis of 47% at 5 years postoperatively in those with a dedifferentiated component and 0% in those with classic parosteal osteosarcoma. Funovics et al  noted that risk of metastatic disease was related to the presence of dedifferentiation in the tumor, not the presence of medullary involvement. Therefore, systemic treatment is not indicated in cases of classic, low grade parosteal osteosarcoma. 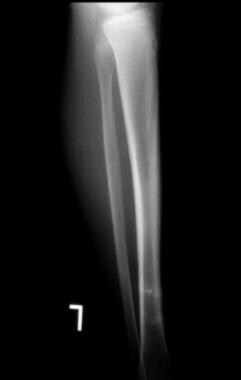 Periosteal osteosarcoma most frequently is seen on the surface of the proximal tibia, though it also has been reported frequently in the tibial and femoral diaphysis. Unlike with the parosteal variant, the posterior aspect of the distal femur rarely is involved (Raymond, 1991). Patients present with a painful enlarged mass. The clinical course progresses more rapidly than that seen with surface cartilage lesions or parosteal osteosarcoma. On plain radiographs, the lesion demonstrates heterogeneous ossification (see the first image below). Radiolucency may be seen with a greater frequency in periosteal tumors than in parosteal osteosarcoma and can mimic the appearance of myositis ossificans. A history of trauma may point toward the latter lesion, but periosteal osteosarcoma cannot be excluded. An accompanying periosteal reaction may be present in the form of a Codman triangle (see the second image below). Ill-defined erosion or thickening of the underlying cortical bone may be noted (see the third image below). Lateral radiograph of the tibia demonstrating a periosteal osteosarcoma. The lesion shows only vague mineralization in the anterior soft tissues. Gross specimen of a periosteal osteosarcoma. Lobulated tumor is evident within the surrounding periosteal bone response (Codman triangle). 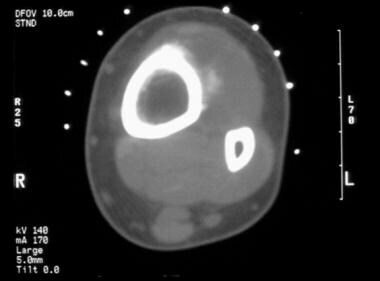 CT scan of the periosteal osteosarcoma seen in the image before the previous image. The soft tissue mineralization is better delineated. However, the mineral within the tumor is not well organized. Underlying cortical erosion is present, without evidence of medullary involvement. However, the incidence of intramedullary extent varies among reports, with rare intramedullary involvement noted in some studies, while Cesari et al  noted involvement in 70% of patients. Unlike what has been reported for parosteal osteosarcoma, intramedullary involvement may impact the prognosis of periosteal osteosarcoma. In the Rizzoli series,  metastases were noted only in patients demonstrating intramedullary involvement; this may indicate a subset of patients with more aggressive tumors. Treatment consists of wide surgical resection. The Mayo Clinic series reported an 80% survival rate with surgical treatment. An 84% 10-year survival rate was noted in a report from the Rizzoli Orthopaedic Institute  ; patients in this series were treated with surgical resection, with some patients also receiving chemotherapy. Patients typically present with an enlarging painful mass and swelling. Unlike the other surface osteosarcomas, duration of symptoms prior to diagnosis of this variant is short; most patients present within 1-6 months. The tumor most commonly is located in the mid or distal femur or in the tibial diaphysis. Medullary involvement may be difficult to detect but is best assessed preoperatively on MRI, especially on T2-weighted images. In the Mayo Clinic series, 33% of the tumors that were evaluated with cross-sectional studies demonstrated medullary involvement. Extensive medullary involvement suggests the diagnosis of conventional intramedullary osteosarcoma with extraosseous extent. As with all three types of surface osteosarcoma, the prognostic significance of medullary involvement is unclear. High-grade surface osteosarcoma is histologically identical to the conventional intramedullary form. Sheets of pleomorphic spindle cells produce the osteoid matrix. High-grade surface osteosarcoma can be distinguished from dedifferentiated parosteal osteosarcoma by a lack of adjacent low-grade areas. The long-term survival rate is less than 33% with adequate surgical resection alone. Local recurrence is significantly associated with a less than wide margin. The overall prognosis is affected by the initial grade of the tumor, response to neoadjuvant chemotherapy, and the presence of local recurrence. Huvos AG. Juxtacortical osteogenic sarcoma. Bone Tumors: Diagnosis, Treatment, and Prognosis. 2nd ed. Philadelphia: WB Saunders; 1991. 157-77. Seeger LL, Yao L, Eckardt JJ. Surface lesions of bone. Radiology. 1998 Jan. 206(1):17-33. [Medline]. Temple HT, Scully SP, O'Keefe RJ, Katapurum S, Mankin HJ. Clinical outcome of 38 patients with juxtacortical osteosarcoma. Clin Orthop Relat Res. 2000 Apr. 208-17. [Medline]. Baker AC, Rezeanu L, O'Laughlin S, Unni K, Klein MJ, Siegal GP. Juxtacortical chondromyxoid fibroma of bone: a unique variant: a case study of 20 patients. Am J Surg Pathol. 2007 Nov. 31(11):1662-8. [Medline]. Unni KK, Inwards CY. Chondrosarcoma (primary, secondary, dedifferentiated, and clear cell). Dahlin’s Bone Tumors: General Aspects and Data on 10,165 Cases. 6th ed. Philadelphia: Lippincott Williams & Wilkins; 2010. Chap 6. Ogata T, Miyazaki T, Morino T, Nose M, Yamamoto H. A periosteal chondroma in the lumbar spinal canal. Case report. J Neurosurg Spine. 2007 Oct. 7(4):454-8. [Medline]. 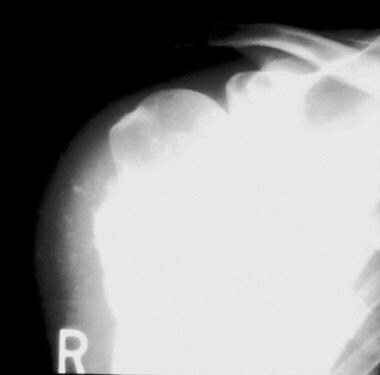 Luevitoonvechkij S, Arphornchayanon O, Leerapun T, Khunsree S. Periosteal chondroma of the proximal humerus: a case report and review of the literature. J Med Assoc Thai. 2006 Nov. 89(11):1970-5. [Medline]. Papagelopoulos PJ, Galanis EC, Mavrogenis AF, Savvidou OD, Bond JR, Unni KK. Survivorship analysis in patients with periosteal chondrosarcoma. Clin Orthop Relat Res. 2006 Jul. 448:199-207. [Medline]. 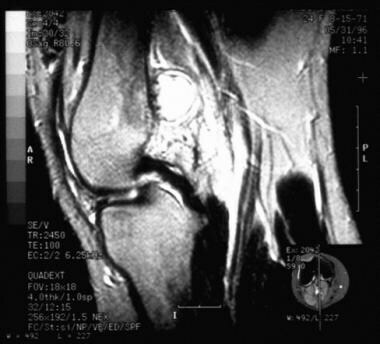 Putti TC, Kahn LB, Aprin H. Periosteal chondrosarcoma: a case report and review of the literature. Arch Pathol Lab Med. 1997 Jan. 121(1):70-4. [Medline]. Jelinek JS, Murphey MD, Kransdorf MJ, et al. Parosteal osteosarcoma: value of MR imaging and CT in the prediction of histologic grade. Radiology. 1996 Dec. 201(3):837-42. [Medline]. Franchi A, Comin CE, Santucci M. Submicroscopic and immunohistochemical profile of surface osteosarcomas. Ultrastruct Pathol. 1999 Jul-Aug. 23(4):233-40. [Medline]. Chen P, Wang SJ, Wang HB, et al. The distribution of IGF2 and IMP3 in osteosarcoma and its relationship with angiogenesis. J Mol Histol. 2012 Feb. 43(1):63-70. [Medline]. Lewis MM, Kenan S, Yabut SM, et al. Periosteal chondroma. A report of ten cases and review of the literature. Clin Orthop. 1990 Jul. (256):185-92. [Medline]. Vigorita VJ. Periosteum. Orthopaedic Pathology. 3rd ed. Philadelphia: Lippincott Williams & Wilkins; 2016. 328-39. Miller SF. Imaging features of juxtacortical chondroma in children. Pediatr Radiol. 2014 Jan. 44 (1):56-63. [Medline]. Ricca RL Jr, Kuklo TR, Shawen SB, et al. Periosteal chondroma of the cuboid presenting in a 7-year-old-boy. Foot Ankle Int. 2000 Feb. 21(2):145-9. [Medline]. Amary MF, Bacsi K, Maggiani F, et al. IDH1 and IDH2 mutations are frequent events in central chondrosarcoma and central and periosteal chondromas but not in other mesenchymal tumours. J Pathol. 2011 Jul. 224(3):334-43. [Medline]. Damato S, Alorjani M, Bonar F, et al. IDH1 mutations are not found in cartilaginous tumours other than central and periosteal chondrosarcomas and enchondromas. Histopathology. 2012 Jan. 60(2):363-5. [Medline]. Scarborough MT, Moreau G. Benign cartilage tumors. Orthop Clin North Am. 1996 Jul. 27(3):583-9. [Medline]. Goedhart LM, Ploegmakers JJ, Kroon HM, Zwartkruis EC, Jutte PC. The presentation, treatment and outcome of periosteal chondrosarcoma in the Netherlands. Bone Joint J. 2014 Jun. 96-B (6):823-8. [Medline]. Rosa M, Bajestani S, Davis C, Makary R, Villas B. Fine-needle aspiration biopsy diagnosis of costal juxtacortical chondrosarcoma presenting as an abdominal mass. Diagn Cytopathol. 2010 Nov. 38 (11):837-40. [Medline]. Yen CH, Chang CY, Teng MM, Wu HT, Chen PC, Chiou HJ, et al. Different and identical features of chondroblastic osteosarcoma and chondrosarcoma: highlights on radiography and magnetic resonance imaging. J Chin Med Assoc. 2009 Feb. 72(2):76-82. [Medline]. Chaabane S, Bouaziz MC, Drissi C, Abid L, Ladeb MF. Periosteal chondrosarcoma. AJR Am J Roentgenol. 2009 Jan. 192(1):W1-6. [Medline]. Boulytcheva IV, Kushlinskii NE, Dvorova EK, Kazachok IV, Makhson AN. Expression of matrix metalloproteinases 1, 2, 9 and their tissue inhibitor-1 in cartilage-forming osteal tumors. Bull Exp Biol Med. 2010 Sep. 149(3):341-6. [Medline]. Cleven AH, Zwartkruis E, Hogendoorn PC, Kroon HM, Briaire-de Bruijn I, Bovée JV. Periosteal chondrosarcoma: a histopathological and molecular analysis of a rare chondrosarcoma subtype. Histopathology. 2015 Oct. 67 (4):483-90. [Medline]. Roos E, van Coevorden F, Verhoef C, Wouters MW, Kroon HM, Hogendoorn PC, et al. Prognosis of Primary and Recurrent Chondrosarcoma of the Rib. Ann Surg Oncol. 2016 Mar. 23 (3):811-7. [Medline]. Song WS, Jeon DG, Kong CB, Cho WH, Lee SY. Outcome of re-excision for intralesionally treated parosteal osteosarcoma. J Surg Oncol. 2011 Mar 1. 103(3):264-8. [Medline]. Hewitt KM, Ellis G, Wiggins R, Bentz BG. 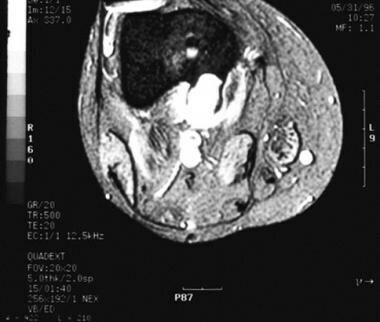 Parosteal osteosarcoma: Case report and review of the literature. Head Neck. 2008 Jan. 30(1):122-6. [Medline]. Bertoni F, Bacchini P, Staals EL, Davidovitz P. Dedifferentiated parosteal osteosarcoma: the experience of the Rizzoli Institute. Cancer. 2005 Jun 1. 103(11):2373-82. [Medline]. Kavanagh TG, Cannon SR, Pringle J, et al. Parosteal osteosarcoma. Treatment by wide resection and prosthetic replacement. J Bone Joint Surg Br. 1990 Nov. 72(6):959-65. [Medline]. Sheth DS, Yasko AW, Raymond AK, et al. 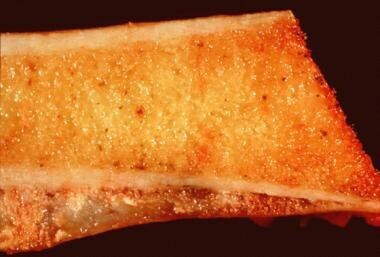 Conventional and dedifferentiated parosteal osteosarcoma. Diagnosis, treatment, and outcome. Cancer. 1996 Nov 15. 78(10):2136-45. [Medline]. Abe K, Kumagai K, Hayashi T, Kinoshita N, Shindo H, Uetani M. High-grade surface osteosarcoma of the hand. Skeletal Radiol. 2007 Sep. 36(9):869-73. [Medline]. Okada K, Frassica FJ, Sim FH, et al. Parosteal osteosarcoma. A clinicopathological study. J Bone Joint Surg Am. 1994 Mar. 76(3):366-78. [Medline]. Yoshida A, Ushiku T, Motoi T, et al. Immunohistochemical analysis of MDM2 and CDK4 distinguishes low-grade osteosarcoma from benign mimics. Mod Pathol. 2010 Sep. 23(9):1279-88. [Medline]. Dujardin F, Binh MB, Bouvier C, et al. MDM2 and CDK4 immunohistochemistry is a valuable tool in the differential diagnosis of low-grade osteosarcomas and other primary fibro-osseous lesions of the bone. Mod Pathol. 2011 May. 24(5):624-37. [Medline]. Funovics PT, Bucher F, Toma CD, Kotz RI, Dominkus M. Treatment and outcome of parosteal osteosarcoma: biological versus endoprosthetic reconstruction. J Surg Oncol. 2011 Jun. 103(8):782-9. [Medline]. Rose PS, Dickey ID, Wenger DE, Unni KK, Sim FH. Periosteal osteosarcoma: long-term outcome and risk of late recurrence. Clin Orthop Relat Res. 2006 Dec. 453:314-7. [Medline]. Murphey MD, Jelinek JS, Temple HT, Flemming DJ, Gannon FH. Imaging of periosteal osteosarcoma: radiologic-pathologic comparison. Radiology. 2004 Oct. 233(1):129-38. [Medline]. Papagelopoulos PJ, Galanis E, Sim FH, Uni KK. Periosteal osteosarcoma. Orthopedics. 1999 Oct. 22(10):971-4. [Medline]. Cesari M, Alberghini M, Vanel D, et al. Periosteal osteosarcoma: a single-institution experience. Cancer. 2011 Apr 15. 117(8):1731-5. [Medline]. Okada K, Unni KK, Swee RG, et al. High grade surface osteosarcoma: a clinicopathologic study of 46 cases. Cancer. 1999 Mar 1. 85(5):1044-54. [Medline]. Hoshi M, Matsumoto S, Manabe J, Tanizawa T, Shigemitsu T, Takeuchi K. Report of four cases with high-grade surface osteosarcoma. Jpn J Clin Oncol. 2006 Mar. 36(3):180-4. [Medline]. Raymond AK. Surface osteosarcoma. Clin Orthop. 1991 Sep. (270):140-8. [Medline]. Anderson ME. Update on Survival in Osteosarcoma. Orthop Clin North Am. 2016 Jan. 47 (1):283-92. [Medline].